Nobody ever wants to be uncomfortable. When it comes to our well-being, most people just want to feel good, have energy, freely live at a comfortable and pleasing weight, get good “check-ups” at the doctor and be able to enjoy life. Sounds simple enough, right? The disconnect for many people seems to be the realization that achieving those common desires really does require an investment of work, effort, decision and discipline. Of course, those things may be perceived as pain or discomfort by some. People often opt to avoid such feelings of relative discomfort whether that felt physically, mentally or emotionally. It’s their choice to do so. That perspective or approach typically works fine … for a time … until something occurs. Typically folks who took that route end up with a result, condition or circumstance much different than they really desired. Feeling good … Energy … A pleasing weight ... Freely living. Those things have somehow all slipped away. The cumulative effect of choosing little comforts along the way has created a much more significant DIS-comfort. It may be realized physically, mentally, emotionally and for some even relationally, financially or in other ways. What? 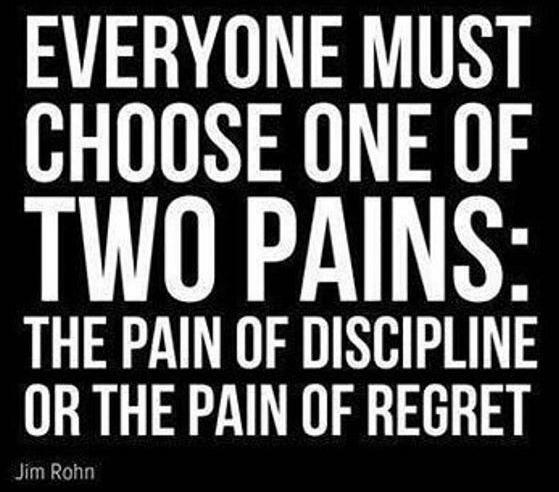 The “pain” of discipline … or the “pain” of regret? Ugh! Nobody wants pain! Of course, nobody wants regret either! This principle will totally hold true for you if you are battling a weight issue – no matter if it’s a relatively small amount you need to lose like 10 - 15 nagging pounds … or a situation involving dozens or even hundreds of pounds. It is human nature to not want to endure the “pain” or discomfort of resolving that weight issue. The secret to doing so lies in the perspective of that discomfort – and the linking you make with it. Am I truly comfortable right now? Is there any pain (physically, emotionally, financially, relationally, etc.) associated with me being overweight or obese? Is it painful looking into the mirror? Or, trying on clothes? Is it uncomfortable not being able to do some activity that’s important to me? Maybe it’s travelling? Dating? Or doing my job? Is it painful to think I may not live as long as I should or see someone special in my life grow up, get married, etc. Who is/are those people? Talk about uncomfortable. Those are tough questions to ask. Yet, they are real and, if taken seriously, they CAN be helpful to start shedding some truth about this matter of choosing our discomforts. 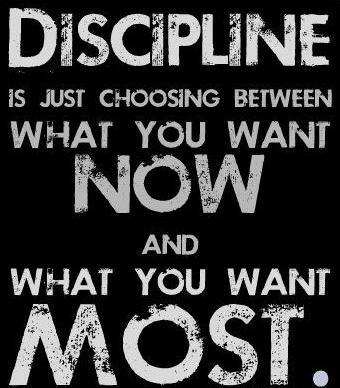 When one considers “discipline” in that context it may be easier to hear and apply. After all, it comes down to a few key words taken from this quote. The first word is YOU. When it comes down to your weight and your health, it’s about you and what you want for your life… not what everybody else wants or expects. Next, is the word CHOOSING. 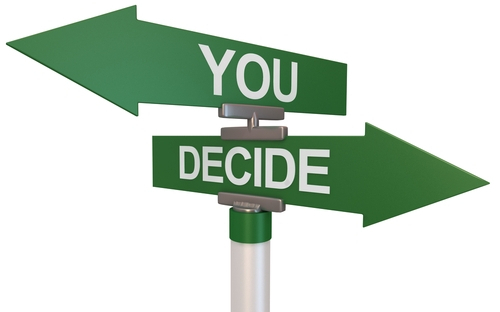 This indicates that it’s in your control to choose between the NOW and the MOST important things in your life. Those can only be defined by YOU. Chunking down the seemingly BIG challenge of discipline into “bite size” action steps helps many people succeed in our program. In other words, don’t think about the BIG challenge (pain) of losing X number of pounds, inches or sizes. Rather, focus on the small and less significant “discomfort” of winning the challenge of choosing one (better for you) food over another. Or, consider the actual ease of buying this, skipping that, etc. We often talk about winning THIS meal and ultimately winning THIS day. One meal and one day at a time! These are relatively small action steps that when combined consistently feel really good! It is rewarding. It builds momentum. And the discomfort of these small steps are almost guaranteed to be less painful than the cumulative effect many feel today with their weight, size and poor health. The MOST painful things to think about for many are those life experiences they may miss, the negative and costly circumstances they may cause or the people and relationships they may impact if they do NOT change. Those deep seated feelings are what create the regret Jim Rohn referenced in the first quote above. 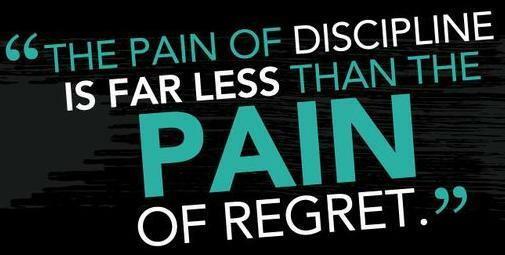 Regret is more of a truly painful feeling. It’s different than the “discomfort” of making a good eating choice, of skipping something, etc. Regret associated with our weight and health is brewed over time. It is way stronger and more difficult to resolve than those small daily discomforts. In reality, although the small daily decisions may seem difficult it’s the cumulative effect that is most difficult. This last quote summarizes this perspective of daily disciplines and regret very well. The GOOD NEWS is you get to Decide about your Discomfort. Choose Wisely! We are here to help empower you to do that. Click, call or just come in!